In the nonprofit sector, the fall generally marks the kick-off into the fundraising season with charitable events like galas and races, online giving days and of course, end of year campaigns. For the past five years in the Greater Richmond region this time of year was marked by the Amazing Raise – a 36-hour online giving event in mid-September that featured competitive grant prizes awarded before and after to nonprofits through various challenges, video contests and a 5k race. Hosted by The Community Foundation (TCF), the annual event produced more than $7M for hundreds of local organizations. In 2015, donations from 21,000 online gifts totaled $1.8M which included $150k or more in prize money to instill fun and competition amongst participants. ART 180 gives local youth living in challenging circumstances, like poverty, the threat of violent crime and substance abuse, the chance to express themselves through art, and to share their stories with others. Partnering with other organizations that serve young people, ART 180 designs projects that allow for self-expression, and creates venues for this expression in the community. The name reflects their vision of turning lives and communities around 180 degrees. ART 180 also operates Atlas, an art center for teens and gallery space for young people in Jackson Ward. 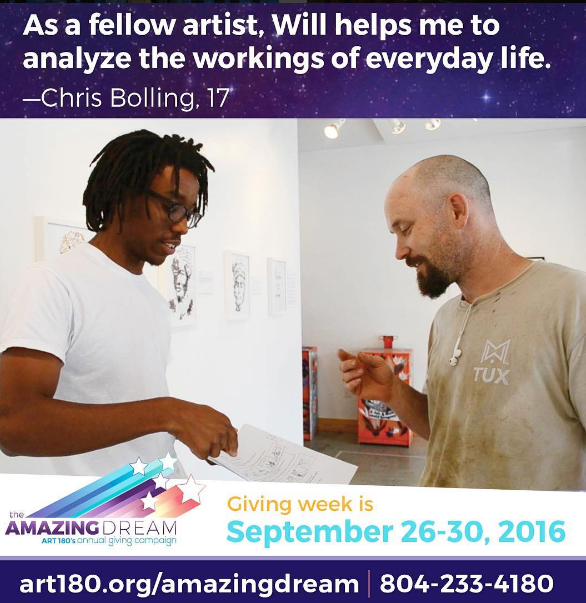 From September 26th to 30th – ART 180 held a grass-roots campaign called “The Amazing Dream”, with a goal of raising $7,500, leveraging matching gift donations for each day of the campaign, and showcasing stories of teen leaders in their programs. The theme for the campaign was the “ART 180 universe” and dollars raised would help support over 30 programs and 350 youth the organization serves each year. In the end, the campaign raised over $30,000 – $10,000 from individual donations, and $20,000 from matching gifts! Trey Hart, ART 180 Resource Development Manager shared more details of what went into the campaign and what’s next for ART 180. ABOVE: ART 180 teen leader Chris Bolling guides viewers through the ART 180 “galaxy”, highlighting stories of 4 special teen leaders in their orbit. Throughout the week they shared short video vignettes, photos, and recollections of good times spent and lessons learned over the years. 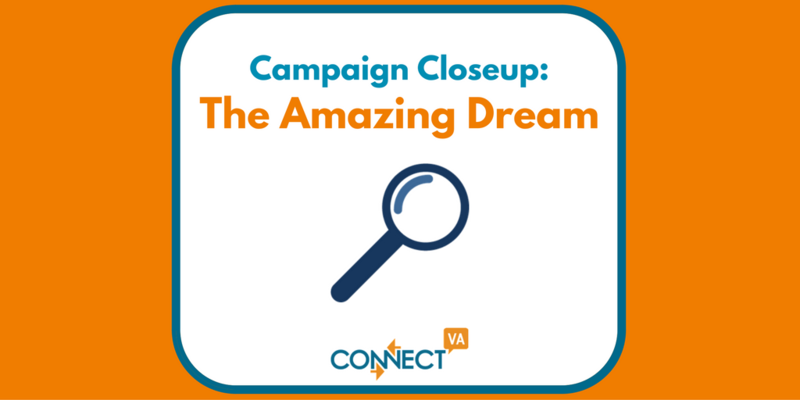 Where did the idea for the Amazing Dream campaign come from? The Amazing Dream was absolutely inspired by The Amazing Raise. We had a committee already formed to support the Amazing Raise, and they didn’t want to lose the momentum they generated last year. It was a perfect opportunity to transition to a self-sustainable grassroots campaign. How did you decide what would happen during the event? Our committee of 8, made up of ART 180 staff, donors, a board member and other volunteers, made all of the decisions. We liked many aspects of the Amazing Raise, so we decided to keep it time-specific, provide simple incentives (like a “meet our teens” reception at Black Hand Coffee), and use this as an opportunity to engage our major donors and corporations in providing matching gifts. How did you spread the word for the event? The campaign was officially titled “The Amazing Dream: ART 180’s annual giving campaign.” And we went with the theme of the “ART 180 Universe.” Our Communications Manager Emily Hall collaborated with one of our teen leaders to create a series of video vignettes that introduced a teen and their mentor (just one aspect of the ART 180 Universe). She collaborated with a volunteer graphic designer, Cheyenne McQuilkin (Eye Intuitive Arts: http://cheyennejoy.com/) to create a logo, and Emily created a series of branded visuals to send out via Constant Contact daily emails, Facebook, and Instagram. What went well and what didn’t? It took more work than we originally anticipated, especially on the communications side. The success of these campaigns is tied to the amount of times you stay in front of a donor, reminding them to give. We had many late nights crafting emails, refining our communications so that everything would be well-timed. A time-specific campaign was so important! Urgency inspires grassroots donors, think Indiegogo or GoFundMe. We also incorporated our teens, which felt really good. It’s nice to align the organizational values with fundraising campaigns. And, most of all, we had a thoughtful, pre-determined plan that our staff and volunteer committee executed beautifully. Without that, we would have been scrambling. What surprised you about the Amazing Dream? We were surprised at the level of donations. We expected a number of $25 and $50 gifts, but our average gift was $150. A few major donors used this as an opportunity to help us reach our daily matching gift goals. Did you meet your goals for the campaign? We exceeded our $7,500 goal! In the end, we raised a little over $10,000 from individuals and leveraged an additional $20,000 in matching gifts to raise slightly more than $30,000. We also had a goal to reach 100 donors (60 returning and 40 new), which we accomplished. What might you have done differently? We will definitely start earlier next year, but much of what we accomplished we’ll repeat. 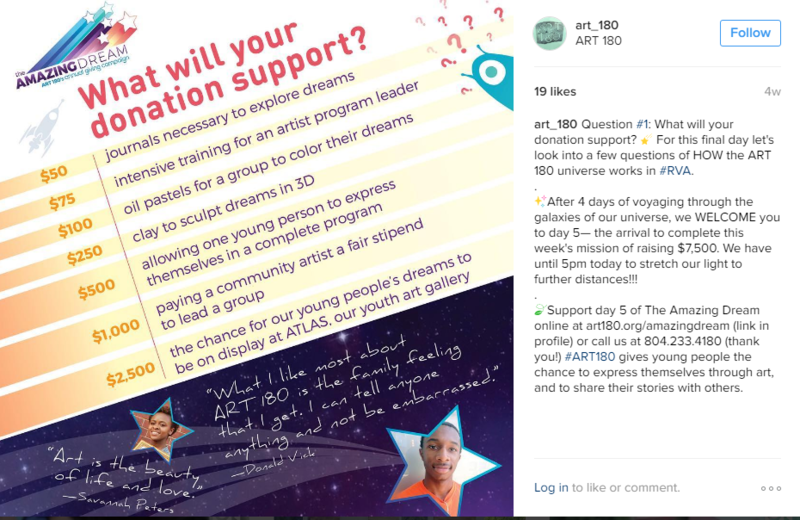 What’s next for Art 180 and the Amazing Dream? This will be a new annual tradition for ART 180. It was so successful this year that we do not need to send a comprehensive fall direct mail appeal, saving us thousands in design costs, printing/mailing costs, and staff time. Did you recently hold a successful fundraising campaign and want to share your insight? Email us at admin@connectva.org! Also, check out these learning opportunities for the foundations of Fund Development and Communications!